What is a Vampire Killing Kit, aka Vampire Hunting Kit, AKA Vampire Slaying Kit? Vampires have been part of legend and lore of almost every culture, dating back to the time of the cavemen. According to these legends, mysterious, night-dwelling creatures, rooted in evil, would terrorize villages and prey on the weak. Although many people today believe that vampires – people who have died, and have been resurrected by some evil, paranormal event and survive by draining and consuming the blood of the living – actually exist, it is commonly accepted that the origin of the vampire story was an attempt by superstitious, uneducated early man to explain the incomprehensible. What sets the vampire myth separate from other occult concepts (such as ghosts and demons), is that the vampire, although immortal, can be fought against and even killed. This can be done by a variety of methods (depending on the culture). Combined with practical tools for traveling (maps, candles, matches, spyglass, compass, etc.) you can see how all these instruments and accessories would make for a very cool, very unique “kit”. Well, according to most accounts, sometime around the turn of the 19th to 20th century, an enterprising individual realized there was money to be made by the Vampire craze. The craze had been kicked-off at the publishing of Brahm Stoker’s DRACULA, and had people all over the world talking about the fictitious beast. But of course, we’re talking late 1800s here, back when travel and communication was expensive and took days or even weeks to accomplish. Because of this, many people thought the book was a work of non-fiction, or at least based in some fact. Castle Dracula in Transylvania must have been a real place…since it was in the book. So, this enterprising individual came up with a great idea. The idea was to use the legends and lore of the vampire, and create a simple yet elegant Vampire Killing Kit for American travelers to take with them when going to Transylvania. The kit would have everything needed (the essentials) to keep them safe, if they were to come in contact with a bloodsucking monster. The builder created a nom de plume, “Professor Blomberg”, as the creator of these kits. The kits were made to look more like a medical-type kit from the Victorian era than a hand-made villager’s kit, and were finished very nicely in neat, wood boxes that were perfect for displaying on a desk (but not so practical for travel). The idea was (probably) to sell them as vampire memorabilia, rather than actual, practical usage. That is one scenario, and probably the most accepted at this time. 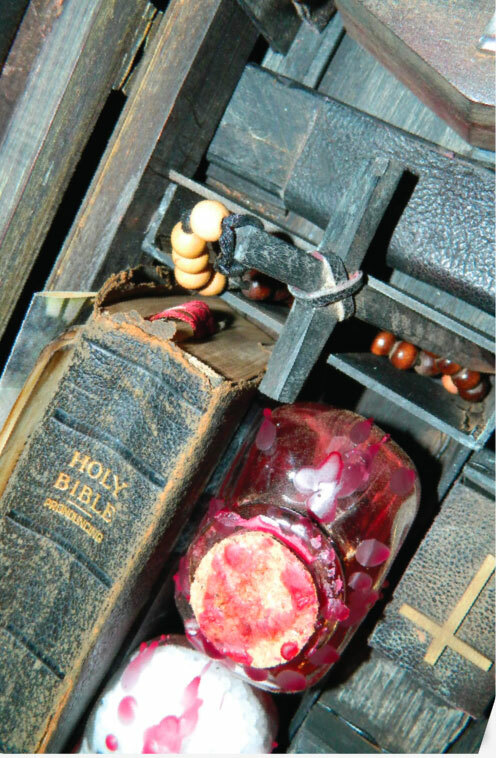 Others suggest that vampire killing kits had been assembled as far back as the middle ages, although none have been found that are proven to be “authentic” at this point. Another story alleges that a gun seller created the concept when he had some vintage pistols that could no longer fire. Trying to figure out a novel idea to package and sell them, he came up with the “vampire killing kit” to showcase the pistol among the other elements of the kit. This idea seems highly plausible, as it is rather easy to find actual, antique contents and boxes to build a seemingly vintage kit. However, this person asserts that he made his first kit in the 1970s. This statement is at odds with Ripley’s Believe it or Not museum, who asserts that they have been finding and collecting these kits for decades before that. Because there are no documents, writings, articles, books, or the like certifying the legitimacy of real antique Vampire Killing Kits, the history is really muddled and unreliable. Did a gun shop owner “invent” the idea in the 1970s? Perhaps he believes he did…as he may not have seen any “original” kits before. And then, of course, there is CRYSTOBAL, who asserts that he saw his first kit at a Ripley’s museum in the 1950s and built his first, primitive styled kit after being influenced by that. However, in all fairness to readers and in the spirit of keeping the internet free of possible misinformation, CRYSTOBAL unfortunately has no actual proof to back up this claim. There are photographs, but we all know photos can be manipulated. There is video, but we know any modern video can be made to look old. It never occurred to the artist to document the dates of his work, so the only solid proof of CRYSTOBAL’s work dates to around 2000, when he first sold a small kit on eBay. CRYSTOBAL would also like to point out that he does not claim to have “invented” the Vampire Killing Kit – only the primitive/hand made style of vamp kit that he builds and sells. It is this style that has been poorly copied in the last decade, which really irritates the hell out of the artist. Again, the whole point of having one of these kits is to have all your tools arranged in a small, easily cartable box…one that looks cool, too. If you have to fumble to get the stakes out, or have to take out three other items to get to the holy water, your box is useless. 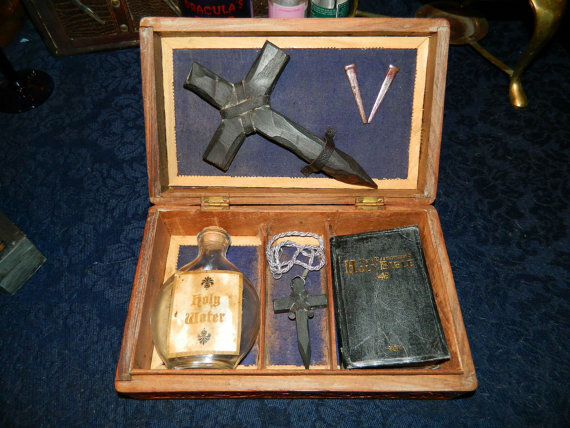 The fun thing about building and selling Vampire Killing Kits is that you can let your imagination run wild. Nothing – no theme, person or place – is off limits. Therefore, special, custom kits can be created for pretty much anything you like. CRYSTOBAL’s themed kits include a 1700’s Revolutionary War era kit, commissioned by General George Washington and “made” in Philadelphia. It included a flintlock pistol, and flint & stone for lighting candles and fires (there were no matches back then). Another is his kit inspired by “True Blood”, which has letters from the Stackhouse family and an extra long length of heavy silver chain. A far-east kit was created when the artist found a box hand carved in India. It was small but very ornate, and included a cross-stake, bottle of holy water and a small cross on a silver chain. Someone even suggested a “Star Wars” themed kit! Although he is still trying to figure out why you would need anything other than a blaster and a lightsaber. CRYSTOBAL is always open to taking orders for custom kits. However, a custom-made kit can take weeks, or even months to create. Depending on the detail and style, and the value/authenticity of the contents, a custom kit can cost anywhere from $400 to as much as $5000. For instance, a basic “prop” kit for theater or private collection, containing a replica pistol and sized at around 12” x 9” x 8” would be in the $400-$600 range. But a realistic and heavy-duty movie prop or kit for a private collection using actual antiques, a real pistol, and hardwood stakes would fetch prices in the higher range. 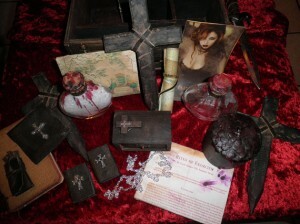 If you are interested in commissioning a custom vampire killing kit, please email us through our Contact Us page.